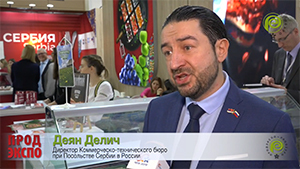 Feedback of the exhibitors and visitors to the 26th edition of the Prodexpo International Exhibition for Food, Beverages and Food Raw Materials, which ran at Expocentre Fairgrounds on 11–15 February 2019. "The Russian Ministry of Agriculture would like to congratulate Expocentre on its 60th anniversary. It is a significant milestone. There was a cancellation of an envelope dedicated to the anniversary. It also was a very happy occasion. Prodexpo showcases a lot of Russian made foodstuffs. I've seen many regions and very many good products. There are also a lot of other countries here. 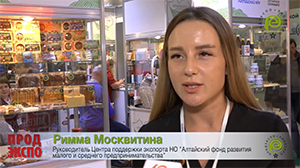 We hope Prodexpo will promote Russian products to foreign markets, especially dairy and meat products. This exhibition is one of the most important events of the year. I hope it will grow year after year." "It is the first experience of the Orlov Chamber of Commerce and Industry in making a joint stand of our enterprises. I think it was a success. We brought processing enterprises and refrigeration equipment. We are thankful to Expocentre for the convenient stand locations. We have a full house today. A joint stand is a very promising format of participation. We wanted to cover all fields of agricultural processing. They are alcohol containing products, meat, dairy, confectionery. Our producers are evry satisfied. They have already signed several very promising contracts. Our region is very well represented. One can try everything. The products are natural, tasty and wholesome. Our experience here is great. Members of our chamber took part in supporting events and the Purchasing Centre for Retail Chains. Here one can sign contacts and start working with retail chains, which is very important for manufacturers. It is our first experience here. We will study it and come back next year. Expocentre Fairgrounds is Russia's main platform which gives all entrepreneurs an opportunity to show their products to the whole world." "We are regular participants in Prodexpo. We come here to show our new products. During the year we develop them, bring new ideas to life, and then show all of them at Prodexpo. This show is very important. It brings together entrepreneurs and offers an opportunity to discuss everything face to face and come to decisions together. One can sign real contracts here. The show is very useful. ROI is always good. The Prodexpo certificate means a positive image. There is no doubt we will come and bring something new." "We are an analytical group. That is why see that there are a lot of right companies at Prodexpo. We have an opportunity to meet them face-to-face and to create an additional networking platform. The AlcoCongress has some influence on the government’s decisions. After the congress, we send a letter about its results to all relevant institutions. It is taken into account in legislation activities and activities of the executive authorities. 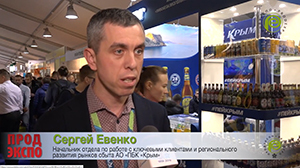 I think that our cooperation with Prodexpo has a positive influence on the development of the whole food market including the market of alcoholic drinks. Thanks to the competence of the Prodexpo team, the show attracts the best experts, analysists, event and marketing companies. There is a synergy of smart people here. Prodexpo is not only keeping up but also growing. We have seen some major projects sinking. Today, the situation in the market is anything but easy. Trade shows are changing their format and transforming. There is Internet and other information technologies. Prodexpo doesn't stay still. It adopts the best international practices and takes into account global trends. We are happy to work with it and help it." "It is our fifth time here with our regional stand. There are ten companies at our stand this year. At first we concentrated on processing of wild plants, but now we have more food industry enterprises. This year we show companies which make beer, ice cream and confectionery. We have new exhibitors. There are also about five regular ones. Our exhibitors say that their participation as part of the joint stand is beneficial as it make them look more reliable to customers. About ten of our companies are independent exhibitors in some product sectors. But they always can come to the joint stand and have talks with their customers under the umbrella of the Tomsk Oblast Administration. All our participants have positive feedback. Good agreements and contracts are in the works. Only half of the exhibition week has passed bur the results are already very good. Over these five years, we had absolutely no problems with Expocentre. It keeps growing. Everything is ahead of it even though the company is already 60 years old." "We have long known about Prodexpo. Last year we had our own stand. This year, the Export Support Centre of the Pskov oblast has arranged a group stand and invited us to exhibit at it. The biggest advantage of participation as part of this stand is that it is financed by the Export Support Centre because we are a small enterprise. It is very important for us. The results will be seen after we process all sales leads and sign contracts. The show is interesting. There are a lot of different visitors here. I hope the results will be very great. We are a small company but we are growing. We want to sell all over Russia and abroad. 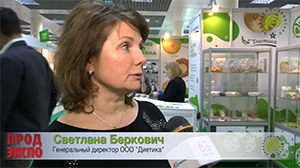 That is why Prodexpo, which is Russia’s main food trade show, is very interesting and important for us. Here we generate sales leads from all over Russia and find potential foreign partners. I would like to congratulate Expocentre on its anniversary. I am glad that it has been working for all these years. I wish it to grow, be trendy and help us in business." "It's the fifth time that we exhibit here. Over these five years, we have noticed a trend that there are more and more local manufacturers, both large and small, which come to the market. It is the largest platform for us to show our products, generate sales leads and sign contracts. The majority of clients are looking for specific products. We have met the most of our customers here at Prodexpo. Now we are working together to grow our business. You can't beat face-to-face communication. I think this format of trade shows will stay for a long time because even using all current technologies people want to meet other people in person. It is very important. Prodexpo is the year's main trade show. That's for sure. It brings together main distributors as well as all other types of clients. As a rule, after the show the number of our new contracts and deliveries to new regions is skyrocketing. This is the show number one! Of course we will come back next year." "We make gluten free products. We have taken part in Prodexpo for almost 15 years. At first we were the only ones here with this type of products. 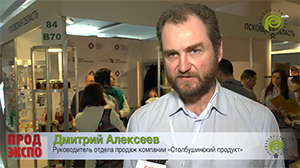 Prodexpo is our only chance to get new contacts and meet customers from all over Russia. Here we meet our buyers with whom we have been working for many eyars. They come from the Far East, Siberia, from all over Russia. What visitors do we have now? Everyone from small shops, small online shops to large network retailers. All categories of Russian buyers. On the occasion of Expocentre's anniversary, I would like to wish this company prosperity, business success, even more interesting events for the business, efforts to help small and medium companies to grow together." Chamber of Commerce and Industry of Serbia. "The Serbian Chamber of Commerce and Industry and Serbian companies have taken part in Prodexpo for more than 20 years. It has already become a tradition. This year we have brought 20 companies which make cheeses, meet products and frozen foods. We occupy 120 sq m at this year’s Prodexpo. We expect to have a larger stand next year. Serbian products are well known in Russia. They attract attention of our business partners and future customers. 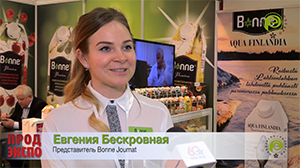 Prodexpo is the most well-known international trade show of food and beverages not only in Russia and also in the CIS countries, everywhere where they speak Russian. It showcases products under all leading global brands from all continents. It is the main show to promote food." "It is our first time at Prodexpo, and we are very glad we are here. We would like to say thanks for great management of the event and very attentive technical staff. Мы занимаемся поставками meat processing and packaging equipment. Our aim is not only to bring stet-of-the-art equipment to Russia but also to provide high quality maintenance services. That is why participation in such shows is very important for us. Many of exhibitors here are our long-standing clients. We have many visitors who represent companies working in the markets of Russia, the CIS and other countries. They are interested to see today's trends in the food industry. We have a huge number of visitors at our stand. We did much work before the show. It is very good that the Prodexpo website has the list of its exhibitors. We have met many of them and hope for further cooperation. Next year we are planning to have a larger stand and a bigger team to have meaningful interaction with people. We love Expocentre. We are regular participants in Agroprodmash. We have been to Moscow’s other venue, and the comparison is in favor of Expocentre." 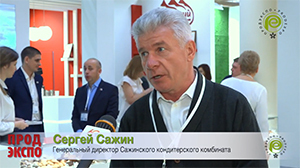 "The Altai krai has long been thinking about exhibiting at Prodexpo. We have been preparing for several years to have this joint stand. 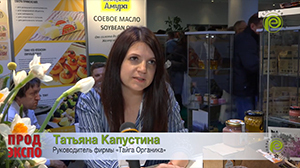 This year the Altai krai team participates in Prodexpo for the first time. There are 13 companies – dairy producers, producers of confectionery, snacks, beer, healthy and functional food, and vegetable fat. Our expectations here are huge. 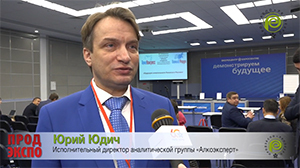 Our companies are looking to expand market reach in Russia, work with Moscow retail chains, retail chains of other regions, as well as to grow exports, find foreign partners and introduce their products to foreign markets. We are happy with the location of our stand. We would like to come to Prodexpo again." "RUSAL is one of the world's largest manufacturers of aluminum and foil. Foil is a basis for production of packaging materials. The food market is one of the largest consumers of these packaging solutions. The Prodexpo exhibitors are our target audience. All our efforts in foil production are directed to these consumers. The exhibition is very respectable. Almost 90% of Russian food manufacturers are here. We will definitely come back. Trade shows are no doubt a must for our company. The other thing is that Moscow is the centre of Russia, and Expocentre is the centre of Moscow. It means that, geography and administrative divisions wise, it is very easy to come and meet here. Everybody knows where Expocentre Fairgrounds is. We don't need to explain people where it is." 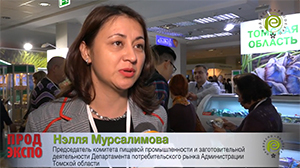 "The joint stand of the Amur oblast at Prodexpo was financed by the Amur Export Centre. This centre was created last year to support export oriented enterprises. We are one of these enterprises. We produce honey. It is our send time at Prodexpo. Last year we came here independently. This year we participate at the group stand with the government's support. Thus year there are five companies ta our stand. One is a soy sauce manufacturers, another one is а honey producer, third one make eco products. There are also two companies that make soy bean curd and handcrafted cheeses. 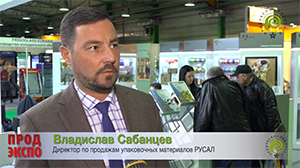 Our products generate interest not only among Russian buyers but also among foreign partners. We had talks with representatives of China and Taiwan. Prodexpo is one of the largest, crowded and efficient trade shows. Next year we might have our own stand again." "It is our first time at Prodexpo. We show a Finish brand of natural products. It is fruit juices, fruit/berry and vegetable purees, and juice drinks. All products are natural. All juices and purees are 100% fruit and don't contain sugar and preserving agents. The most important thing for us here is to show potential customers our products. Now you can buy our brand only in St.-Petersburg. We want to find new clients and distributors all over Russia. We have very different companies visiting our stand here. They are suppliers of raw materials, representative of healthy food stores and confectionery companies, retail chains, retailers form Moscow, Tyumen, Kazakhstan, and of course all those who look for something new and want to see healthy food on the shelves of grocery stores. I believe that this exhibition is very effective. We have talks practically every minute. People show interest and sign agreements and contracts. It’s great. We will definitely come back. It is very beneficial for everyone involved. The show is very convenient and full of information. We wish Prodexpo every success."